The unifying effect of music and dance was evident at the Nathan Hale Senior Village when the F.A.I.T.H. Dance Project and a Long Island dance school visited the Doxsey Place Seniors to participate in their 2nd annual intergenerational day of dance this April. The students, and teachers, performed their award winning routines. The residents also performed, showing off months of hard work and weekly line dancing classes. Then, young and old joined together to learn some new line dances. 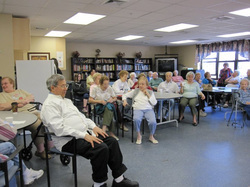 Intergenerational activities are often planned at the Nathan Hale Senior Village. Before this event ended, requests were made for a repeat performance.